Have you ever worked yourself into a corner? The corner of “can I pull up the rug and hide under it”? When you’ve tried to say I’m sorry, and then you ended up saying too much? Words are stronger than Gorilla glue, once the’re said they live a long life. Perhaps forever. 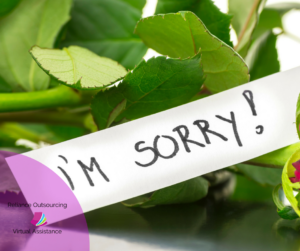 How do you tell a client or employer you are sorry when you’ve made a mistake, especially one where you debated about an action to take, and you chose the wrong path after all. The tiny guy on one shoulder said, “You make the best decisions, just listen to yourself, go for it!” The tiny guy on the other shoulder leaned in and whispered into your ear, “Don’t listen to that other guy, if you have doubt, don’t make that choice!” So, you trust yourself, you make the decision, and two days later (or sooner), you find out you’ve made a large poo-pah. Yes, you’ve messed things up and guess what? There’s no excuse. None. Nada. There is no excuse when you go against your own best intuition. So, don’t make an excuse. Say you’re sorry. Knock their socks off. Don’t fix whatever you’ve done with 100% of your energy, enter into 150%. Go above and beyond. Everyone makes mistakes. It’s the effort that you make that really makes a difference. Nobody is going to give you a pacifier, just fix what you can. Learn from your mistake and focus. No buts, no ifs, but if you have to go beyond the words I’m sorry, you can say, “I learned from this, and will use what I learned ongoing.” Remember, never say never. Never say, “I’ll never do that again.” I do not believe in being jinxed, but we are human, you cannot promise “never.” A promise of never can be broken in a flash of an eye. How do you apologize? Do you have a system in place for handling mistakes? A system that works from truth?